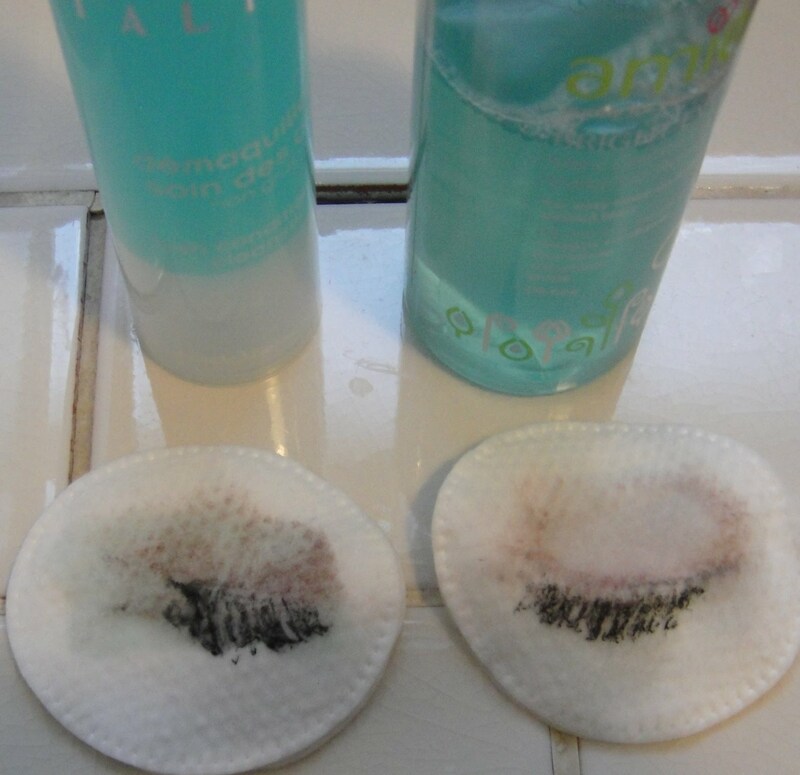 It’s the final week of my eye makeup remover challenge! The contenders are: Talika (100ml £12.72) – winner of last week’s high-end challenge, and Amie (125ml £4.75), the winner of the cheap and cheerful contest the week before. Both removers fared extremely well with my every day makeup, so this week, I’ve made it a bit more difficult. 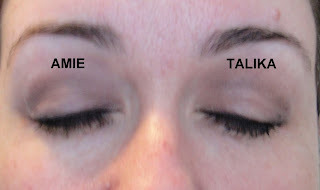 This is a version of my night-time smokey eye makeup, but I’ve altered it slightly to really put the removers to the test. 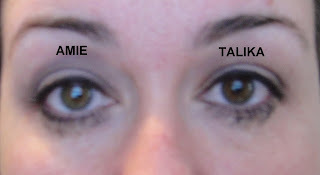 Again, three shades of shadow applied over Urban Decay Primer Potion, but I’ve used MAC Blacktrack fluidliner which is next to impossible to remove once it’s really set in, and waterproof mascara. Max Factor Lash Extension Effect mascara to be exact, which will have it’s own review soon. There’s very little to choose between the contenders at this point, so I’m calling this round a draw. Again, very little to choose between them, however, I am noticing that the skin around the eye I’m using Talika on feels very tacky, and slightly taut, a side effect that I’m not having with the Amie on the other eye. I mentioned in my last review that the Amie stings my skin, but, I’ve had this bottle tested by three other people, and they’ve had no problems with stinging whatsoever, so I’m ignoring that effect for scoring purposes, as that’s my skin at fault, and it’s highly unlikely to affect many other people, unlike the tacky skin-feel of the Talika. Nothing. No smudges, no runs, no flakes. Again, nothing, nada, zip, zilch, zero. 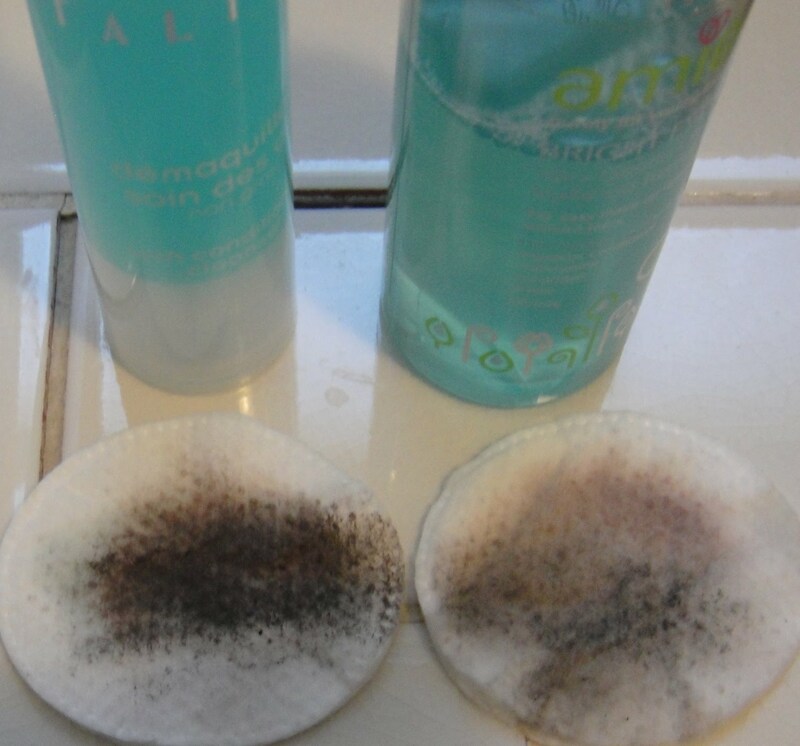 These are both amazing cleansers, and they’ve left not a streak or a smudge of leftover mascara between them, which is just fantastic. However, it means I’m left to judge them on things outside of just their cleansing ability, which is going to make my final judgement slightly unobjective, so bear with me. This is exceptionally difficult to call. 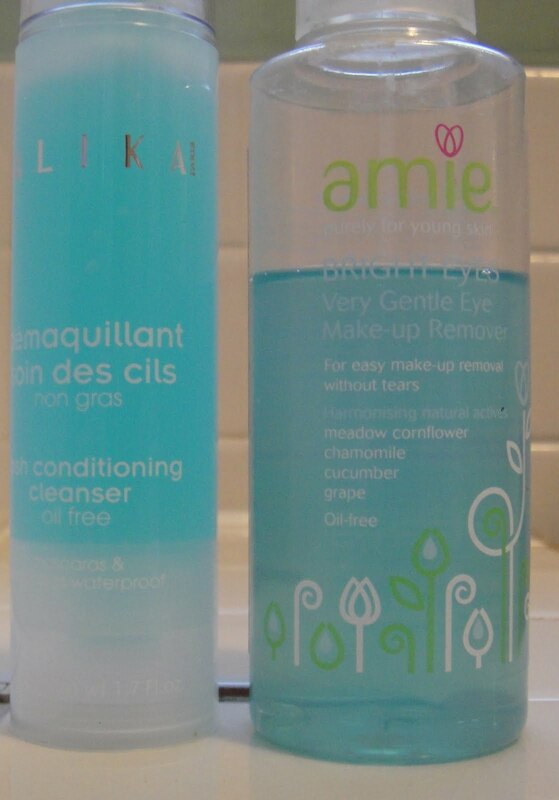 Both products have performed extremely well, and rather better than I expected any oil free makeup removers to perform when I started this trial, but my gut instinct is that if I were to purchase either of these products again, it’d be the Amie (even with the stinging), over and above the Talika. It’s cheaper, for one thing – especially when you compare it on a ml for ml basis – and I prefer how it leaves my skin feeling afterwards, not sticky, not taut, not soapy. It’s an excellent value product, and I think the values behind the company are ones I admire. I realise I am very far from the target market for this range (it’s primarily aimed at teenagers and women in their early 20’s) but I think good skincare is a lesson best learned early. Certainly, it’s one I wish I’d learned earlier. Personally, I think my skin is so sensitive now because there simply weren’t affordable products like this around when I discovered makeup, and I spent a long time applying cheap slap – a lot of cheap slap! – and removing it with the cosmetic equivalent of paintstripper as a result. I think it’s that which has left my skin needing to be treated a lot more gently now. 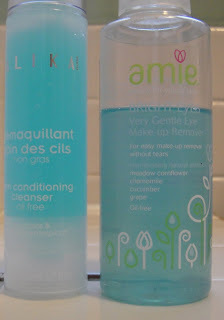 There are a lot of other products in the Amie range, if they’re all made up to this standard – and I suspect they are – it’s a very good skincare range, whatever your age. I am so buying this. Every morning I wake up with mascara on my cheeks after thinking I've got rid of it all the night before.